Jian leans in and presses his ear against his wife Mei’s pregnant belly in their bedroom in Wenge village. 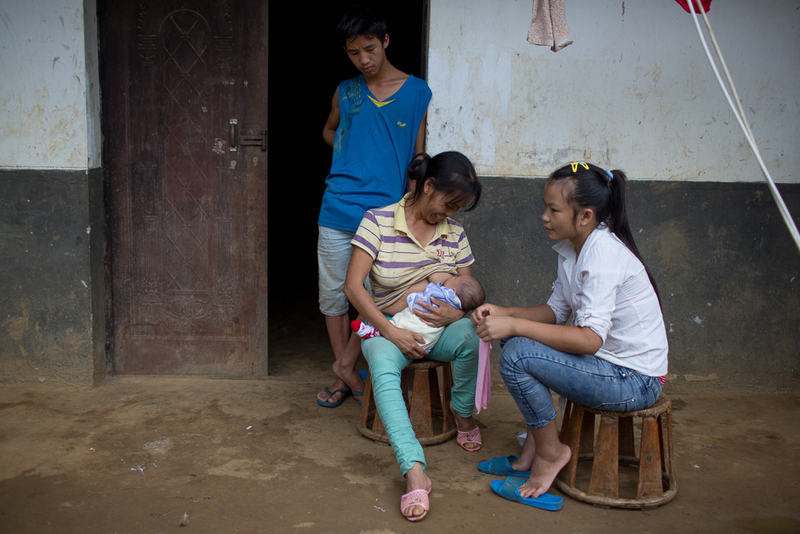 Mei, 17, and Jian, 16, were married for a year and she was nine months pregnant when this photo was taken. Jian said he was hoping for a boy. His parents thought that Jian was too naughty and they wanted him to be more stable, so they pushed him to get married. Jian listened to his parents and he found Mei. The two wed after dating for a few days. Their plan is to move to a bigger city to work after Mei gives birth. 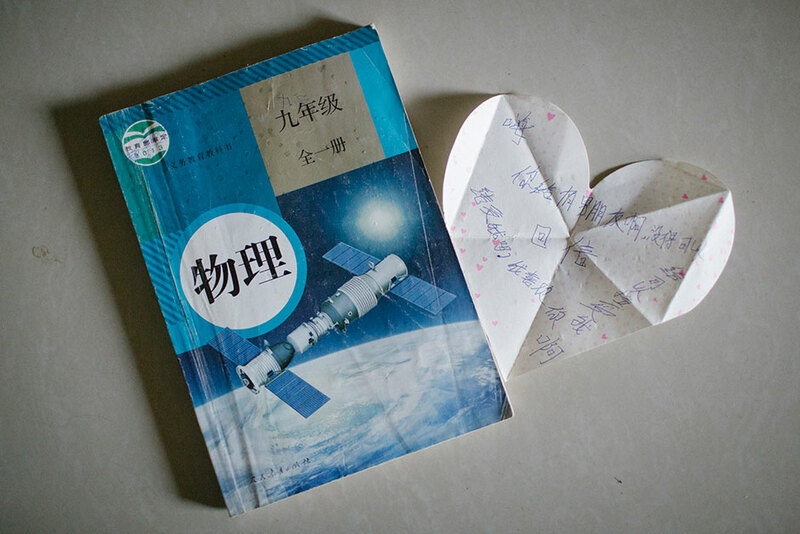 A love letter found in a ninth-grade physics textbook at Guang’s home reads, “Hi, do you have a boyfriend? Can you accept me? I like you, please accept me. Reply.” Shuichang village, Mengla county. 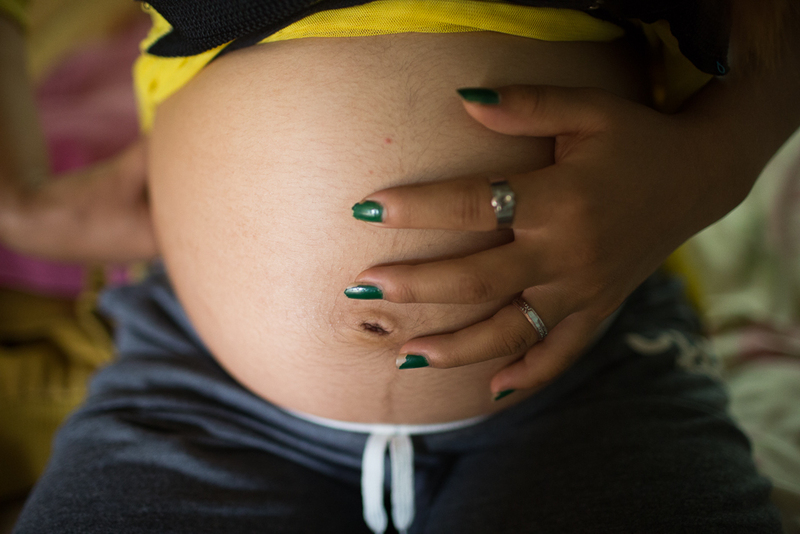 Jie touches her belly at the start of her third trimester at her home. She was 13 years old and her husband 18 when this picture was taken. They met during the Spring Festival and were married three months later. After the wedding, Jie quit school. She didn’t finish the fifth grade. 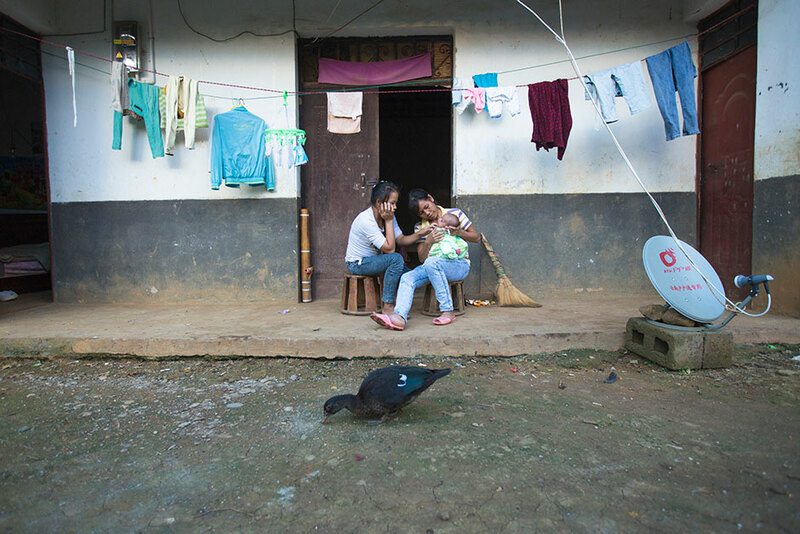 Cai and her mother-in-law play with Cai’s baby in front of their house, in Guangdong village, Mengla county. 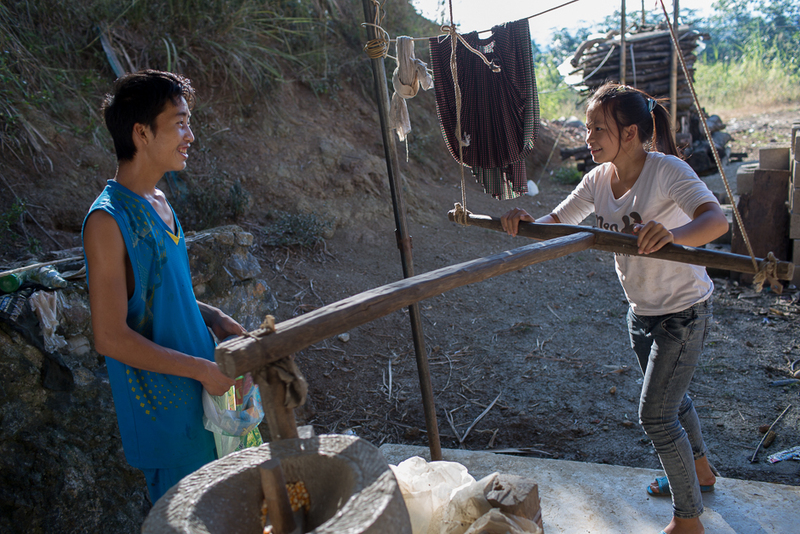 Ming and Cai use a neighbor’s hand mill to grind corn. Courtship is brief and much of the relationship building happens when the young couples are already married. Ming looks on as his mother puts his son’s mouth on her breast in an attempt to calm the child down as Cai looks on. Ming’s mother helps by taking care of the baby most of the time. 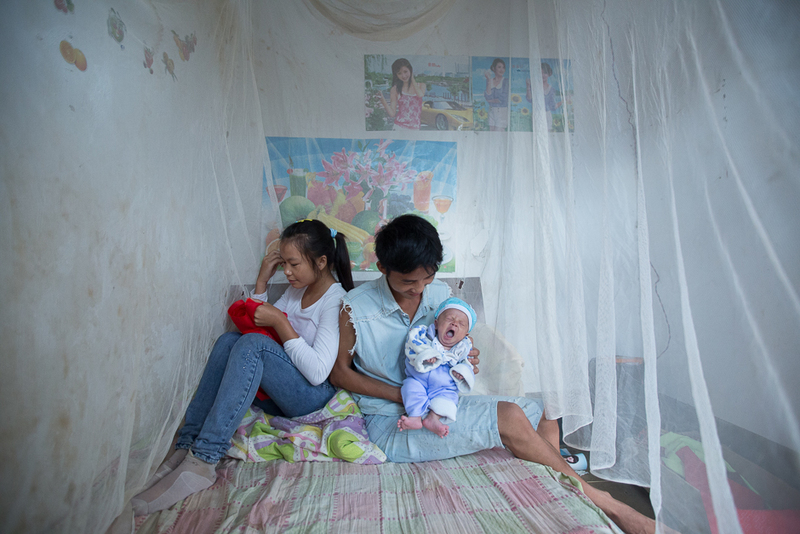 Cai, 16, holds her two-month-old son at home. A year earlier, she married and dropped out of school when her family could no long afford to pay for her education. Wen touches his wife Jie’s pregnant stomach. He is 18 and she is 13 years old. They live together in Tangzibian village, Mengla county. 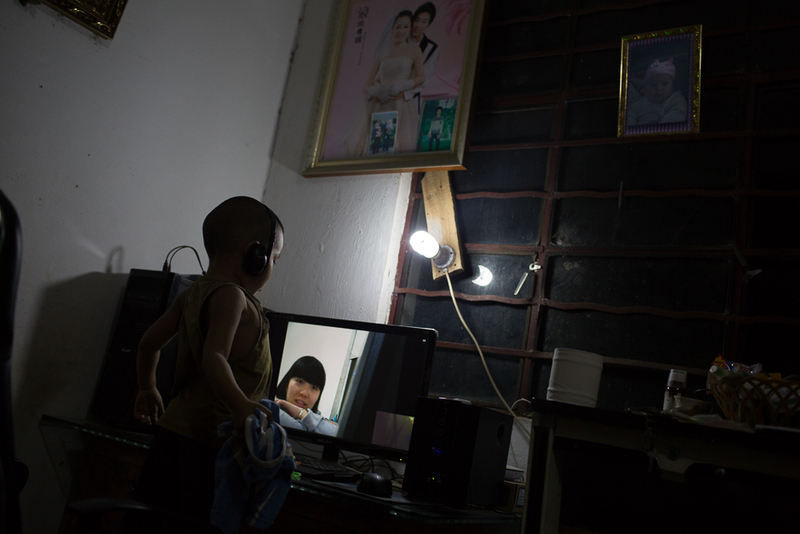 Four-year-old Le video chats from his home in Yunnan province with his mother, a migrant worker living in Zhejiang province. Le lived with his uncle and aunt in Xiaxinzhai village, Zhemi county. For most of his life, Le has lived apart from his 20-year-old parents, since they left to find work in 2012. Jie talks with two neighborhood girls in her room decorated with stickers from the Disney movie “The Little Mermaid” and other designs. Jie’s room still has cartoon characters on the wall and the Chinese character for “hobby,” although the character is incorrectly written. 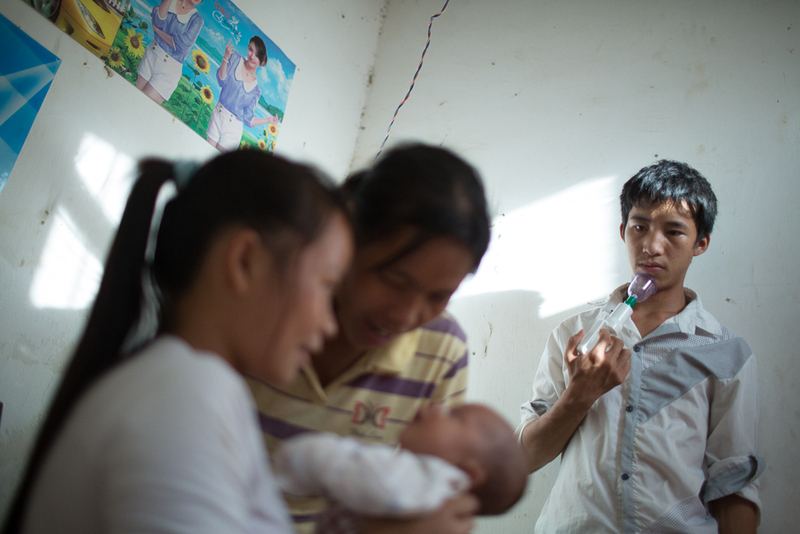 Ming holds a breast pump as he watches his wife, Cai, and his mother care for his newborn at home. “My single friends stopped calling me after I got married, and my life got boring,” Ming said. 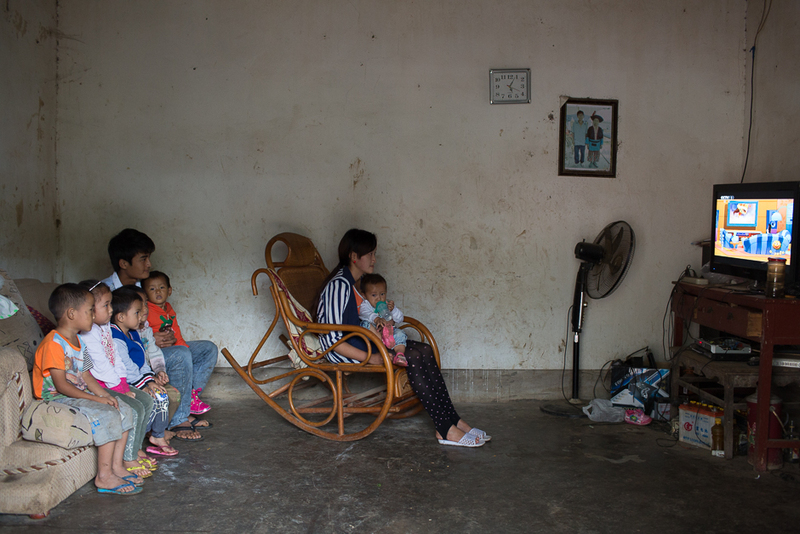 Xin, 16, holds her one-year-old daughter on her lap as she sits in a rocker watching a popular Chinese cartoon, “Big Head Son and Small Head Father,” at her home in Guangdong village, Mengla county. Xin and her husband, seated with neighborhood children on the sofa, started dating three years ago when they were in fifth grade. They dropped out of school when they got married more than a year ago. 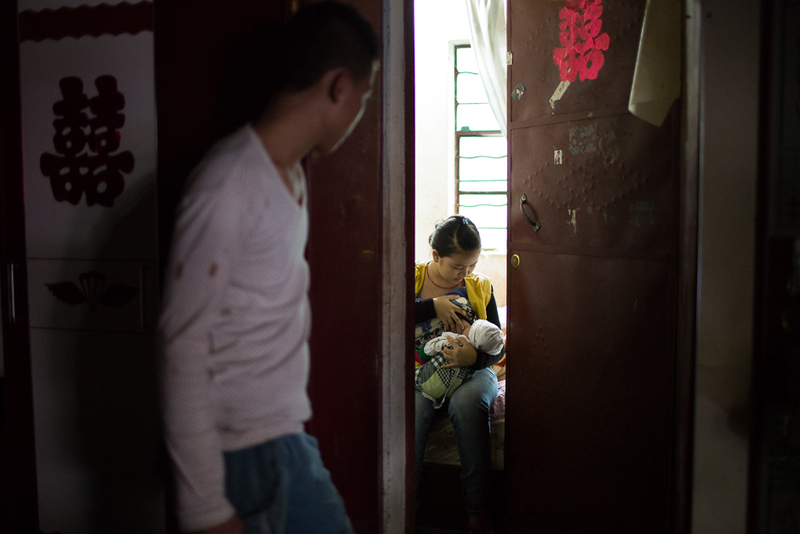 Fang, 18, looks in on his wife, Li, 16, as she nurses their one-month-old baby at home, in Guangdong village, Mengla county. Jie cooks dinner in her in-laws’ outdoor kitchen. She lives in their house with her husband, in Tangzibian village, Mengla county. Her in-laws work in Anhui province as migrant workers, leaving the couple alone in the village. The money they send back every month is the only income for the young couple. 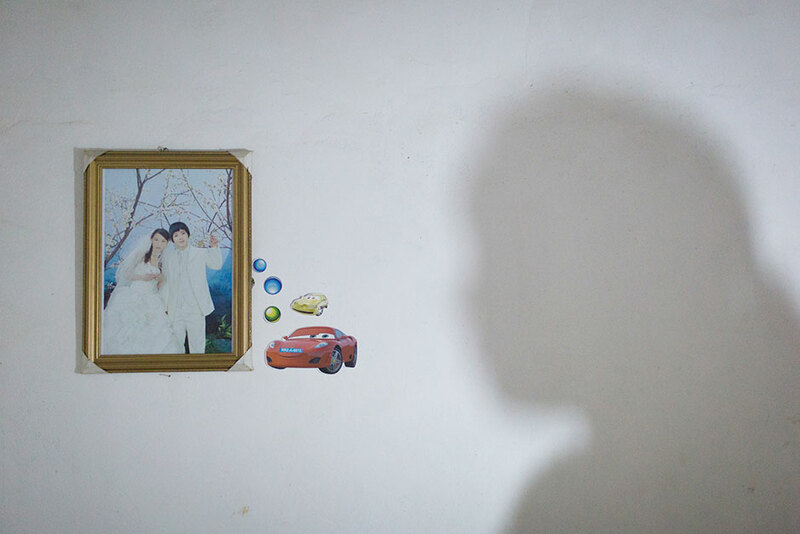 Jie’s shadow falls across her bedroom wall near her and her husband’s wedding photo. 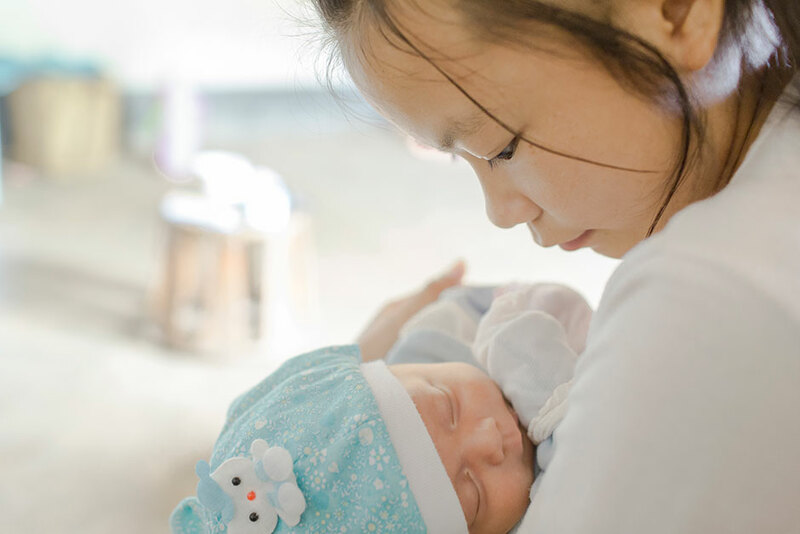 At age 13, Jie was six months pregnant. Her husband is five years older than her. Cai works on a piece of embroidery as Ming holds their baby on their bed. 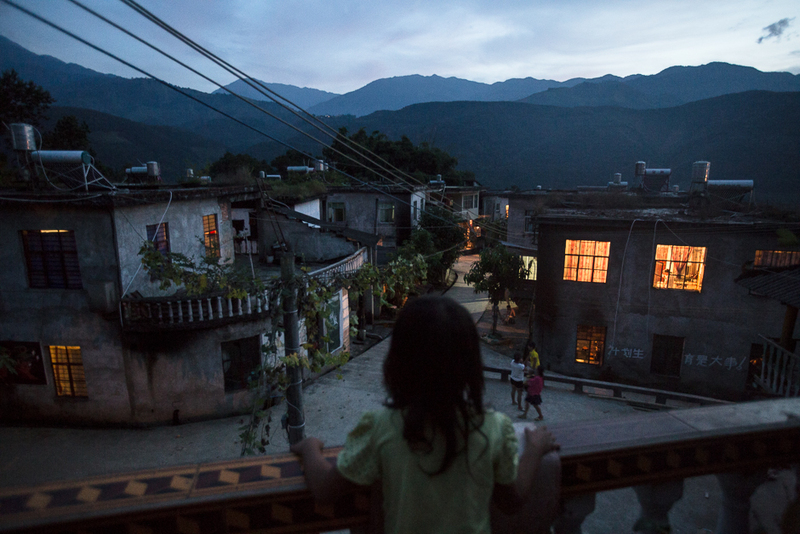 Seven-year-old Yuan looks out over her village from the balcony of a neighbor’s home in Yangxi village, Zhemi county. Yuan has never gone to school because her mother never enrolled her. She said she doesn't know if she ever will go, and says she doesn't know if she wants to. A version of this gallery was originally published by the Chinese website Tencent QQ. In the fall of 2014, a website affiliated with the city government in Kunming, capital of the southwest Chinese province of Yunnan, ran a story about a 13-year-old girl and her 18-year-old husband in Jinping county in the southern part of the province. According to the article, “early marriage” was a common phenomenon in the area and the government found it difficult to control because the parents of the young husbands and wives preferred their children to marry before migrating to the cities to work. China’s legal age for marriage is 20 for women and 22 for men. I was intrigued that the practice of under-age marriage seemed to be flourishing in this particular county, so I decided to travel there with my camera. I flew to Kunming from Beijing and then traveled 420 kilometers by bus, van, and motorbike to the villages the story had mentioned. I stayed in and around Jinping for 18 days and visited 10 villages in all. In almost every village I visited, I found a number of young girls carrying their children. I asked their ages. The youngest was 13. In some of the villages I visited, all of the young people had left to find work elsewhere. In other villages, like Yangxi village of Zhemi township, almost everyone was still at home. Young couples get married early, build a house, and give birth to the next generation as soon as possible, preferring, many told me, to stick close to their farms and live much as their parents and grandparents lived. Interestingly, whether or not young people migrated or not seemed like an all or nothing proposition in most of the villages I visited; either everyone left or everyone stayed put. An old man I met in Guangdong village in Mengla township recalled that both in his parents’ and his children’s generations, people generally got married at 18 or 19 years old, but his grandsons mostly married at 13 and 14. The man had recently been given a great-grandchild, and the baby’s mother is only 16 years old. Most of the young husbands and wives I spoke to had similar complaints. 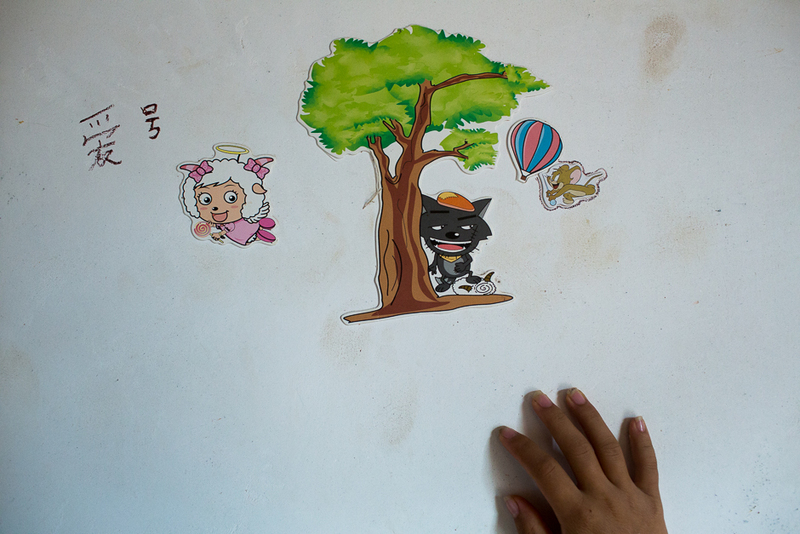 They watch cartoons and have pictures of animated characters on the walls of their rooms. They gaze longingly at other young people who ride motorcycles past their front doors. They still poke fun at each other like teenagers, but they shoulder adult burdens, from housework and farm-work to raising children of their own. Cai dropped out of school after fifth grade because her family couldn’t afford it anymore. She met Ming when she was 15 years old. At the time, Ming had just returned from Guangdong province, where he had been working as a migrant laborer. They dated for three months before getting married. A year later, tending to a newborn, the novelty of living as adults has worn off and they feel both bored and trapped. Ming misses his life outside the village. Now he farms every day. Cai does not leave home, but yearns to. 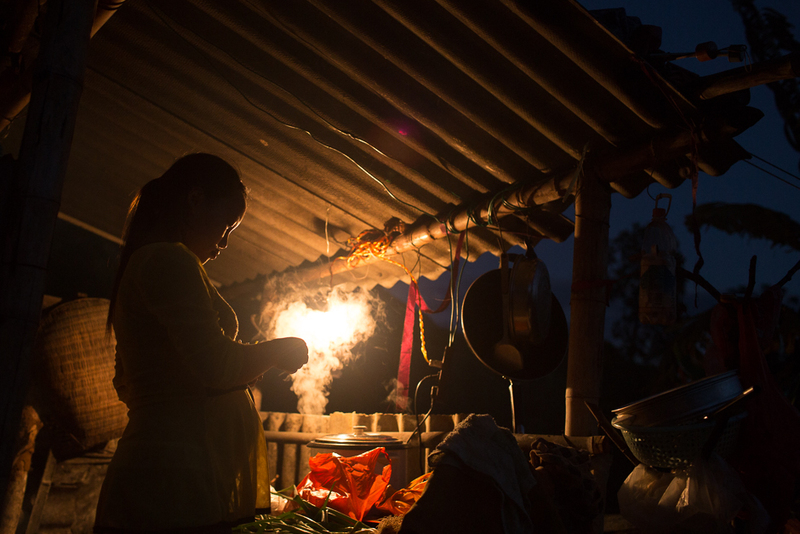 They plan to leave for a big city to work as migrant workers after their child is weaned, but now must contemplate how they will afford to raise the child in a distant city.